When we fail, it's easy to make excuses or blame our circumstances. But let's face it: the biggest enemy is usually the one staring back at us from the mirror every morning. Self-control isn't very popular these days. We tend to think of it as boring, confining, the cop that shows up and shuts down the party. But the truth is that people who cultivate this vital virtue lead freer, happier, and more meaningful lives. After all, our bad habits-from the slight to the serious-bring a host of painful consequences. Ultimately, they keep us from becoming the people God created us to be. 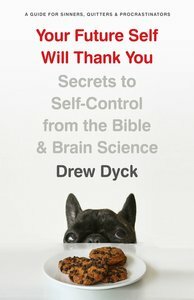 About "Your Future Self Will Thank You"
DREW DYCKis the managing editor ofLeadership Journalat Christianity Today International. Drew holds an M.A. in Theology from Fuller Theological Seminary. Before coming to Christianity Today he was the editor ofNew Manmagazine. He and his wife, Grace, live in Carol Stream, Illinois and attend Jericho Road Church.